The first Primus Checkpoint Sprint went to Elmar Reinders ahead of Dries De Bondt, the latter reinforcing his lead in the combativity standings. After 30 kilometres five riders set up an early breakaway: Francisco Ventoso (BMC), Andrey Grivko (Astana), Tom Scully (Education First-Drapac), Scott Thwaites (Dimension Data) and Jan Willem Van Schip (Roompot-Nederlandse Loterij). They never got more than a minute and were caught back 20 kilometres down the road. Laurens De Vreese (AST), Dylan Groenewegen (TLJ), Markel Irizar (TFS), Jonas Rickaert (SVB), Elmar Reinders (RNL), Guillaume Van Keirsbulck (WGG) and Ludwig De Winter (WVA) formed the second break, gathering a maximum advantage of 4:40. At the second passage on the infamous Muur Van Keirsbulck attacked. Only Irizar and Rickaert managed to stay close, but they were caught by a chasing group with Tim Wellens. With 30 kilometres to go Martens and Rickaert joined Van Keirsbulck, with Valgren dropping out of contention due to a puncture. On the Muur Martens broke away, but just before the Binck Golden Kilometre Wellens and Naesen decided to launch a counterattack. They headed straight to the frontlines and gathered 7 and 8 bonus seconds respectively. Naesen pushed on and left Wellens behind. At the 6 km mark, during a final passage on the Denderoordberg, Stybar was the first to catch Naesen. A small elite group went to the finish with Greg van Avermaet taking the initiative on the Vesten. 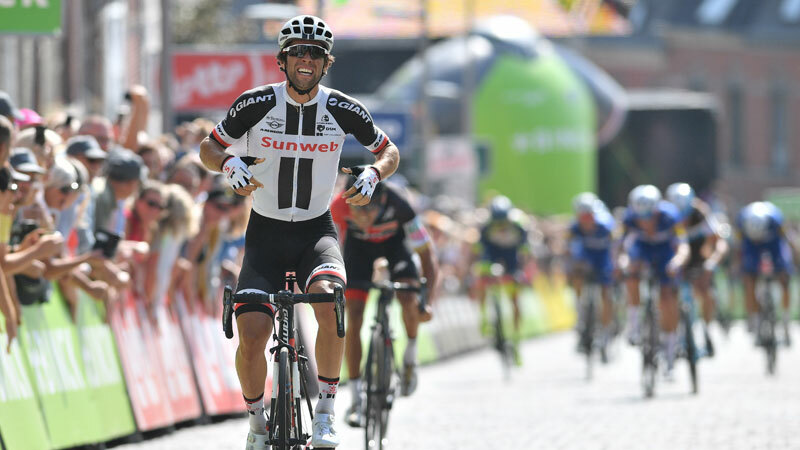 Matthews countered his attack to win the final stage of the BinckBank Tour. Leader Mohoric had a tough day, but managed to hang on. He wins the overall classification by five seconds. At the end Stybar took over the red points jersey from Ewan.